THE REVIEW: To be honest, I wasn’t quite sure what to expect from The World’s End. I knew about the bar crawl and that Simon Pegg and Nick Frost were involved, but the whole apocalyptic alien-invasion part caught me completely by surprise. Perhaps I should have expected something of the sort, given the title The World’s End, but it was quite shocking when halfway through the film it turns from a generally lighthearted comedy into a doomsday scenario. Managing expectations and being hit with a shocking (again, shocking for me; perhaps not many others) twist is only one bit of the film though. For the first half of the film, there’s nothing that leads you astray. It is because of this first half that I think my perception of the second half, and the film as a whole, is somewhat diminished. The World’s End has laughs, but it isn’t what I’d consider funny. Some comedies I have a hard time breathing because I laugh so much and those succeed for that very reason. 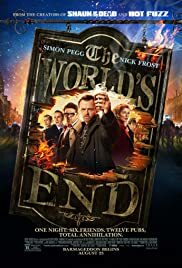 The World’s End disappoints in that regard and underwhelms (surprising given the involvement of Pegg and Frost, two people I usually find hilarious). However, the film does make it up with a fairly innovative and catchy premise: a bar crawl reunion that brings a group of friends back to their hometown for a night of debauchery. That premise alone would make a film I would pay to see and is something you get glimpses of in The World’s End. It has those touching, fond moments of what life used to be like back in the good ol’ days. It also has the reflections on how things have changed since then and how people have grown — or not, in the case of Gary King (Simon Pegg). Sadly, this retrospective is only a small focus of the film. Instead, we’re greeted with brainwashed townsfolk doing the bidding of a ruling alien species. It should be clear I’m not a fan of the apocalyptic element of The World’s End. For those who like that sort of thing, The World’s End is just the film for you. I’m not saying this part ruins the entire film or makes it unwatchable for myself or others with similar tastes. In fact, I was a little intrigued by it and was mildly entertained at some portions of it. But my bias is for the friends aspect of the film which is mostly, but not entirely, neglected. Obviously, to make that the only focus of The World’s End would change the film completely. However, who says I can’t wish for that different film?